Dracula's wife, Lisa Tepes, when burnt on stake for totally being a witch (She wasn't) sparks a unholy and demonic war that could prove to be the end for the people of Wallachia...Except that Trevor Belmont (Star of Castlevania 3: Dracula's Curse) along with Sypha Belnades step up to show the Dark Lord the business end of a whip. Fans of the Castlevania series have been wanting some brand of love for the gothic horror game series since its last entry in the series "Castlevania: Lords of Shadow 2" in 2014. Finally with Warren Ellis writing and Sam Deats directing this four episode anime. Ellis, previously writing for Marvel and being a writer for the 2008 video game Dead Space, brings his brand of energy and expertise to darker storyline (He wrote a run of Hellblazer and Moon Knight for Marvel). 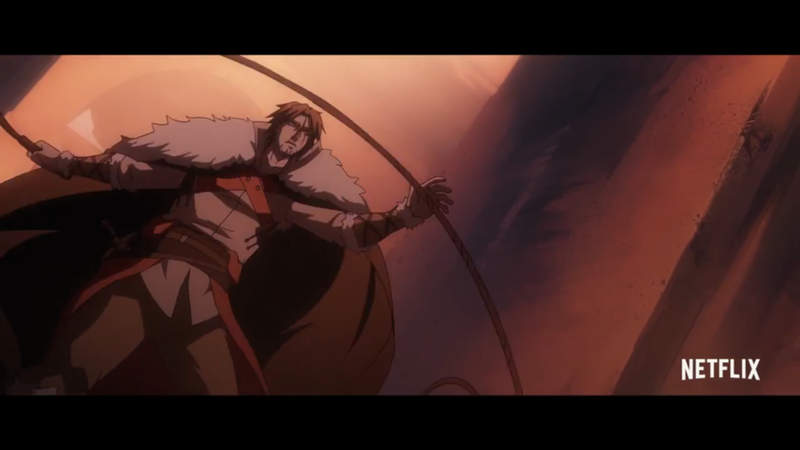 Though this series isn't long it sets up the world and its rules nicely and acts as a means of "Proof of Concept" for the Castlevania series which Ellis has stated is the second piece of his Castlevania trilogy. Coming in about 2 hours in length the series is easily consumed in one marathon session. The major drawback to the series is that its rated R for language, blood, and sexual content (joking about things). However if your not easily offended by such things Castlevania is a good way to spend 2 hours and get your toes wet in the dense mythos that is Castlevania.